Today we’re proud to announce that Gartner has named Zoom a Leader in the 2017 Magic Quadrant for Meeting Services. This is the third time Zoom has appeared in the Gartner Magic Quadrant; it was positioned as a Leader in last year’s Web Conferencing Magic Quadrant, and as a Visionary the year before. The criteria used by Gartner to evaluate companies selected for the Magic Quadrant include completeness of vision and ability to execute. This report examined fourteen vendors across a range of criteria and positioned Zoom as a Leader in relation to other market services. Only three vendors were named Leaders in this report: Zoom, Microsoft, and Cisco. To read the 2017 Gartner Magic Quadrant for Meeting Solutions report, please visit here. 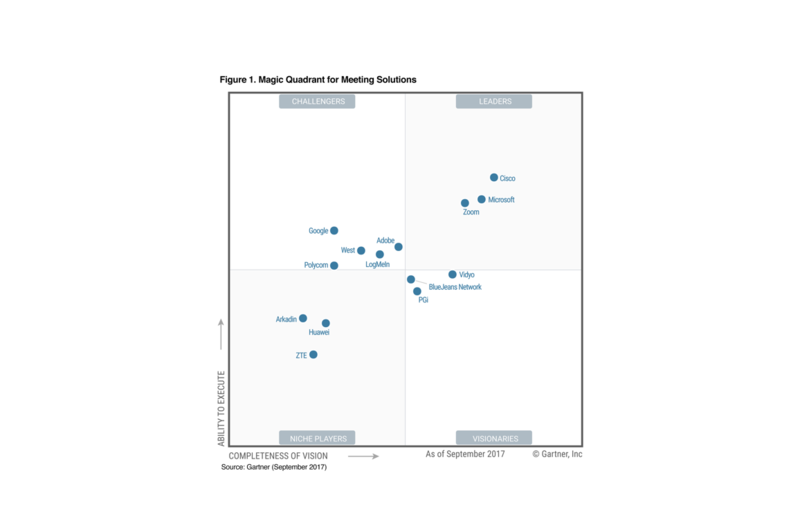 Gartner, Inc. Magic Quadrant for Meeting Solutions, Adam Preset, Mike Fasciani, Tom Eagle, September 18, 2017.